The Department of Radiation Oncology and Radiotherapy at the University Hospital Charite offers the entire spectrum of first-class diagnosis. The department has 14 computer tomographs (CT), ultrasound equipment and 12 magnetic resonance imaging (MRI) devices, which provides fast and modern patient care. An important hybrid method, together with nuclear medicine, are available due to the positron emission computed tomography (PET-CT) and single photon emission computed tomography (SPECT-CT). The department is headed by Prof. Dr. med. Volker Budach. Another important focus of the Department of Radiology is interventional radiology. Here patients can be treated by means of minimally invasive vascular surgery (e.g. reopening of the vessels) and without the use of vascular surgery (e.g. tumor ablation) but with the navigation imaging. To provide advanced and safe interventional radiology services, the center has nine angiography units, an open MRI system and 10 inpatient beds. According to the Focus magazine rating of 2017, the Department of Radiation Oncology and Radiotherapy at the Charite University Hospital ranks among the top German departments specializing in radiation therapy! The treatment of breast cancer, lung cancer, esophageal cancer, stomach/colon cancer and gynecological tumors involves the use of the state-of-the-art technologies, such as Clinac DHX, Cyberknife, Novalis and Tomotherapy. These technologies are unique across all of Europe and enable doctors to implement highly complex therapeutic methods. An essential characteristic of these technologies is an extremely high accuracy of radiation, which allows doctors to attack tumor with a highly concentrated dosage of radiation and at the same time to preserve the surrounding healthy tissues as much as possible. 2009 President of the German Society for Radiation Oncology (DEGRO). Since, 2009 Head of the Tumour Centre Berlin. 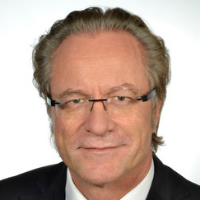 Since 2006, Professor and Head of the Department of Radiation Oncology and Radiotherapy, Campus Virchow and Mitte, Charite University Hospital Berlin. 2008 Founding Member of the Interdisciplinary Head and Neck Group of the German Cancer Society (DKG). 2006 - 2010 Founding Member and Chair of the Interdisciplinary Soft Tissue Sarcoma Group of the German Cancer Society (DKG). 2007 - 2009 President of the German Society for Radiation Oncology (DEGRO). 2003 - 2006 Executive Board Member of the EORTC. 2003 - 2006 Chairman of the EORTC Clinical Research Division. 2000 - 2003 Chairman of the ROG Working Group on Head and Neck Cancer. 1996 - 1998 Head of the Tumour Centre Berlin. 1998 - 2004 Treasurer of the ESTRO. 1995 - 2007 Head of the Department of Radiation Oncology, Robert-Rössle-Klinik, Charite University Hospital Berlin. 1993 - 2006 Professor and Head of the Department of Radiation Oncology and Radiotherapy, Campus Mitte, Charite University Hospital Berlin. 1990 - 1993 Senior Physician and Reader at the Department of Radiation Oncology, West German Tumour Centre, University of Essen, Essen, Germany. 1985 - 1990 Senior Physician and Consultant at the Department of Radiation Oncology, West German Tumour Centre, University of Essen, Essen, Germany. 1972 - 1980 Study of Medicine at the of Heidelberg and Kiel. Department of Radiation Oncology and Radiotherapy.